Most kids dream of having a tree house for a hideaway or just a place to play in. Some parents indulge their kids and build one for them. 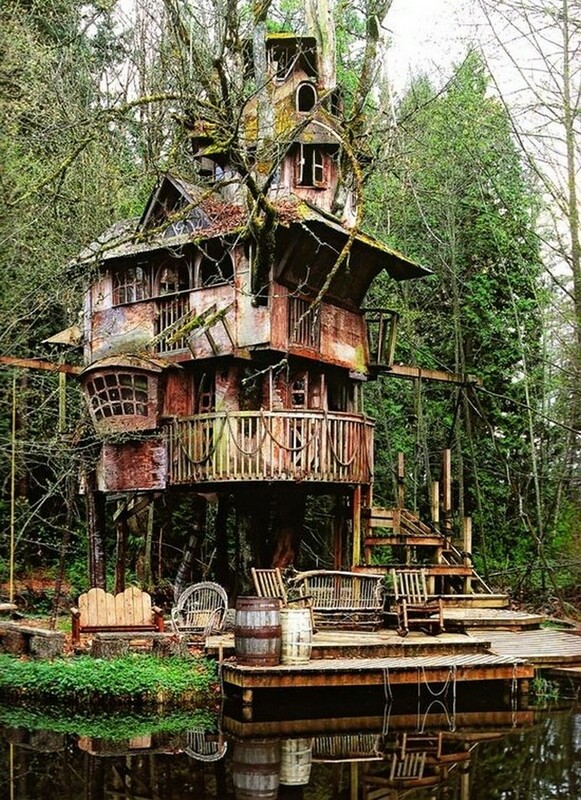 One dad took to the task on a higher level – literally – three storeys high in fact, with what is now known as the Redmond Tree House in Washington. The tree house is quite impressive. It was built around a broad-leafed maple tree surrounded by a forest and right beside a lake. It has a jetty, a moat, and a spiral staircase to take visitors all the way to the top floor. The house features many windows with an intricate designs, a balcony, a lookout, and a beautiful roof that’s covered in moss. It looks magical, especially when one sees it peeking from amidst the trees surrounding it. Its owner, Steve Rondel, built the tree house for his children over 20 years ago, when his eldest was 5 years old. Sadly, the children outgrew it before the tree house was finished. But it survived the years and the seasons, giving it that naturally aged look very similar to those found in fairy tale story books. The builder, judging from the cobwebs and dirty windows must have abandoned the project for some time. Story has it however that he is working on it again, and looks forward to completing and restoring it to its old glory for his future grandchildren to enjoy. Although an oddity, in a pleasant way, the tree house has piqued the curiosity of locals and other passers-by. Who would not be drawn to such an authentic looking enchanted tree house in a forest? Click on any image to open the lighbox display. Hit esc or click the ‘x’ to close the lightbox. Enjoy!